At last what you've all been waiting for, an affortable quality UHF diversity radio mic kit at a price to suit the tightest budget. Add onto that the fact that it has 4 switchable channels and the build and sound quality you'd expect from one of the world's leading brands of radio mic and you've got yourself the best value radio mic on the market today! Available as a Vocal Set with a hand/held transmitter, a Presenter set with bodypack with ME2 lapel mic, Headmic set with AVL618 headset mic or Instrument set with bodypack and instrument cable. great handling, simple, easy-to-set controls, and a design that reflects its stature as a serious professional instrument. So what's new about the G2 series, well it has 9 banks of presets each with 4 stored preset frequencies, it also has 4 user programable freq that you can set to any of a range of 1440 freq, pilot tone. It also has auto scan to find clearest frequencies, good old AA batteries to give cheaper consumables, xlr output on the receiver and the bodypack transmitter is 1/3 smaller! If you need a new radio microphone then Sennheiser G2 delivers the goods!!! Lavalier Kit 1 - This system is ideal for theatre and presentation use. The unobtrusive ME 2 omnidirectional clip-on microphone is virtually invisible. Available with EK 100 pocket receiver system. Lavalier Kit 2 - This 100 Series system is ideal for PA applications. The ME 4 cardioid clip-on microphone is virtually invisible and has excellent feedback rejection. Vocal Cardioid Handheld - This system is ideal for vocal applications. 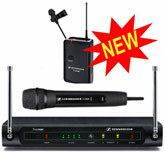 Features the EM 100 receiver system with SKM 100 hand-held transmitter and MD 835 cardioid head. Vocal Hyper-Cardioid Handheld - This system is ideal for vocal applications in venues with high ambient noise levels. Features the EM 100 receiver system with SKM 100 hand-held transmitter and MD 845 hyper-cardioid head. Vocal Super-Cardioid Handheld - Due to the SKM 165's (condenser, super-cardioid) excellent feedback rejection and wide dynamic range, this system is ideal for vocals and presentations. Headset Super-Cardioid - This system is ideal for hands-free vocal applications. Supplied complete with the ME 3 headmic (which has superb feedback rejection). This system gives complete freedom of expression to stage vocalists as well as proving a boon to sports and aerobics instructors. Instrument - This system is for connecting musical instruments (e.g. guitar) which have a 1/4" (6.3 mm) jack socket directly to the bodypack transmitter. ENG KIT - The ew 100-ENG G2 system is ideal for video recording in the most varied recording situations. The ME 2 clip-on microphone and extremely small SK 100 G2 bodypack transmitter combined with the SKP 100 G2 plug-on transmitter mean you can mic any situation with hand held or tie clip! The small portable receiver comes complete with camera mounting bracket and xlr cable so you have everyting in one package! Lavalier Kit 2 - This 100 Series system is ideal for PA applications. The unobtrusive ME 4 cardioid clip-on microphone is virtually invisible and has excellent feedback rejection. Vocal Cardioid Handheld - This system is ideal for vocal applications. Features the SKM 300 hand-held transmitter and MD 835 cardioid head. Vocal Hyper-Cardioid Handheld - This system is ideal for vocal applications in venues with high ambient noise levels. Features the SKM 300 hand-held transmitter and MD 845 hyper-cardioid head. Vocal Super-Cardioid Handheld - Due to the SKM 365's (condenser, super-cardioid) excellent feedback rejection and wide dynamic range, this system is ideal for vocals and presentations. Headset Super-Cardioid - This system is ideal for hands-free vocal applications. Supplied complete with the ME 3 headmic (which has superb feedback rejection). This system gives complete freedom of expression to stage vocalists as well as proving a boon to sports instructors. In recent years a further major advance in live sound production has allowed performers to dispense with the use of traditional monitoring systems for their foldback and enjoy even greater on-stage freedom. Personal stereo systems using a wireless link to receive a monitor mix are replacing floor wedge and side-fill speaker cabinets. Each set consists of a stereo in ear phone with a special earpiece that is attached to the portable bodypack receiver (custom ear molds can also be used with the receiver pack). The system receives monitor sound from the fixed transmitter. Separate transmitters, receivers, mics, cables and all accessories are available for all Evolution Series Systems, please contact us for more details and prices.